Growth just continues for the thriving town of Fort Mill, as a stunning new community of homes is underway. Trinity Ridge, a beautiful new development in Fort Mill, has just opened its third and final phase of the neighborhood by JPOrleans, a Philadelphia-based homebuilder. The firm purchased approximately 100 acres of land from the developer and has created 63 homesites. The lots will all be generously sized, averaging over an acre, and they feature an idyllic mountain-like setting. These homes will start at around $700,000 and some will top out at $1.3 million. These unique estate homes Will be nestled among trees and along a scenic creek for the ultimate peaceful setting. Homes will average between 3,500 and 4,500 square feet. The pricier and higher end homes in the community along Sugar Creek will potentially be built by custom homebuilder New Old of Fort Mill who would create 14 Southern Living Home Collection houses. Trinity Ridge is located off of old Springs Road in the southeastern quadrant of Fort Mill. It’s a great community for families, not only because of the neighborhood itself, but also because Fort Mill boasts some of the best schools in the nation. Plus, Fort Mill is one of the fastest growing communities in the region and features plenty of southern hospitality and charm. 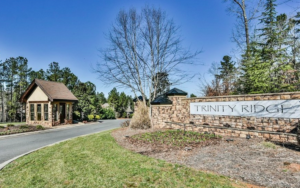 It is conveniently located near the bustling metropolis of Charlotte with an easy 30-minute drive, and it is also close to beautiful Lake Wylie. For more details on Trinity Ridge, visit trinityridgereserve.com or check out the article at bizjournals.com.